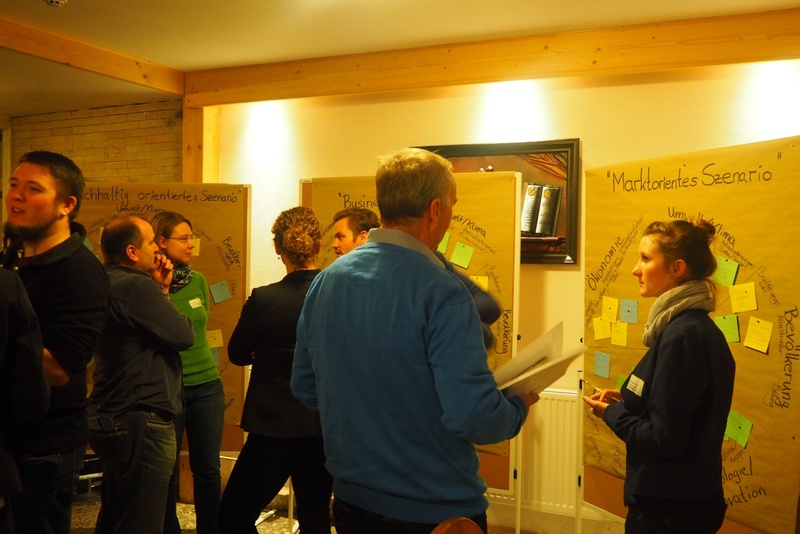 With the aim of promoting knowledge transfer in the German case study region Upper Rhinluch, the Leibniz Centre for Agricultural Landscape Research (ZALF) and agrathaer Ltd. invited regional stakeholders at the 30th of November 2017 to the Information Day “Innovations and chances for success in sustainable intensification and fens management” to Paulinenaue, Brandenburg. More than 30 participants from agricultural practice, administration, environmental protection and nature conservation organizations and science took the opportunity to inform themselves about the latest project results from the EU-project VITAL and other research projects (PROVIDE, Q2GRAS). Participants and scientists discussed promising concepts for sustainable intensification of land use, e.g. opportunities for direct marketing, and established new informal cooperations. In a scenario development exercise, the potential futures of the Rhinluch region were drafted by the participants. However, the main interest lay in the agri-environmental measure “Moorschonende Stauhaltung” (peatland management) and its implementation and combination with other governance mechanisms. It was presented alongside information on the EU funding program European Innovation Partnership (EIP) and the fens management option “paludiculture” (reed cultivation) at the “Market of Opportunities”. The Information Day left much room for open dialogues and constructive exchanges, which were gladly accepted by the participants.